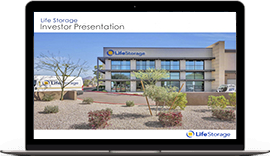 Life Storage, Inc. (NYSE:LSI) is a leading national owner and operator of self storage properties, with more than 700 locations in 28 states. Since entering the industry in 1985, we have grown to one of the largest, most respected self storage operators in the world. We serve both residential and commercial customers by providing innovative storage and logistics solutions. We strive to maintain a customer-centric culture throughout our organization, thereby creating a positive rental experience. We look to maximize shareholder value through a variety of channels including (a) optimization of our operating platforms - revenue management, internet marketing and a 24/7 customer care center; (b) continuously evaluating and implementing internal growth strategies including re-development, joint ventures and third-party management relationships and; (c) property acquisitions. Our capital structure is conservative and flexible with 99% of our assets unencumbered and a consistently high fixed charge coverage. We maintain investment grade ratings with Moody's: Baa2 and Standard & Poors: BBB.